Ibadan, located in Western Nigeria, is the country’s second largest city and capital of the Oyo state. A 2006 Nigerian Census shows the population of Ibadan at 1,138,639 citizens. Home to the University of Ibadan, it is a leader in the nation’s institutions of education, health, and economics. The dominant religions are Christianity and Islam. Although literature suggests the initial creation of the city as circumstantial, the growth and transition of Ibadan into one of the dominant cities in West Africa confirms its relevance and impact. The history of Ibadan had long been preserved through oral history but written records place its official founding in 1829. After the collapse of the Yoruba Empire towards the end of the 18th century, the area which is now Ibadan had been populated by Yoruba rebels. Located between the forests and the plains and surrounded by seven hills, it functioned as a sanctuary for the fighters that fled. Ibadan served that purpose again in the early 19th century when the intertribal conflict that led the Ife, Ijebu, and Oyo ethnic groups to flee the Fulani who were expanding into the region from the northwest. When the British extended a protectorate over the region in 1893, Ibadan had roughly 120,000 residents. The British colonial administration built a railroad that reached Ibadan in 1901 and eventually reached Kano in Northern Nigeria by 1912. As a major trading center along the rail route Ibadan grew rapidly and prospered because the surrounding region produced cassava, cocoa, cotton, rubber, timber, and palm oil. As its population grew, the city also developed manufacturing and service industries. In 1948 the University of Ibadan was founded as a branch of the University of London. As such it was the first institution of higher education in the most populous colony in Africa. Two years following Nigerian independence in 1960, the University of Ibadan became independent as well. With its University College Hospital and the International Institute of Tropical Agriculture, the University of Ibadan remains one of the leading institutions of higher education in Nigeria and the rest of Western Africa. Ibadan’s government, like that of Nigeria, began the process of decolonization in the 1950s. 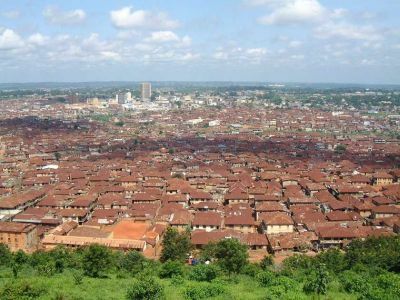 At independence in 1960, Ibadan was the third most populous city in Africa after Cairo and Johannesburg. During the first years of independence, however, from 1960 to 1980, the powerful Western State government dominated the city administration and monopolized the taxing authority. By the early 1990s privatized services such as schools, health facilities, and even roads emerged due to the inability of Ibadan’s government to provide basic services. In 1991 the Nigerian federal government returned control and especially taxing authority to metropolitan Ibadan which in the same year became capitol the of the newly organized and smaller Oyo state. Bolanle Awe, "Militarism and Economic Development in Nineteenth Century Yoruba Country: The Ibadan Example," The Journal of African History, Vol. 14, No. 1 (1973); Fourchard Laurent, "The Case of Ibadan, Nigeria," in Understanding Slums: Case Studies for the Global Report on Human Settlements http://www.ucl.ac.uk/dpu-projects/Global_Report/pdfs/Ibadan.pdf; Nigerian Medical Association. The Federal Republic of Nigeria, National Bureau of Statistics http://www.nigerianstat.gov.ng/.